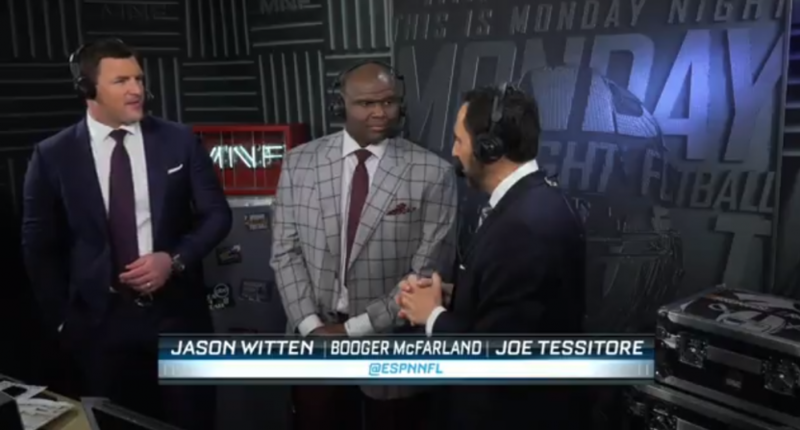 Anthony “Booger” McFarland has spent the much-maligned 2018 Monday Night Football season for ESPN in a weird crane-like thing known as the “Booger Mobile.” It’s a rather obnoxious contraption on the sidelines that has obstructed views and seemed like an entirely unnecessary gimmick. McFarland’s view probably doesn’t even actually contribute to any additional insight to the games over what Joe Tessitore and Jason Witten see from the booth, and mainly just works as a fancy-looking on-field view (and a reminder to those in the stadium that, “In case you somehow forgot, it’s Monday Night Football!”). Well, Booger isn’t in the Booger Mobile for the Broncos-Raiders Christmas Eve game in Oakland, due to rainy conditions. And he’s actually in the booth! Twitter took notice of Monday night’s Booger-to-booth move. Guys, they took Booger out of the kart. He is in the booth. RIP Booger mobile. Week 16 – ESPN realizes Booger should have been in the booth all along. So, #MMF finally moved Booger into the booth tonight. Was that so hard? Big improvement. Now, there’s actually been a plan to have Booger in the booth- for the ESPN International broadcast of the Super Bowl. And if his booth performance is well-received for this Broncos-Raiders game (and/or that ESPN International broadcast), maybe ESPN will consider making it a permanent thing.